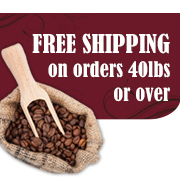 Save big on six of our TOP SELLING specialty coffees when you make a 40lb minimum purchase per coffee! Orders of 40lbs or more ship free. Kaffe Magnum Opus is 100% dedicated to customer satisfaction. Every order is backed by our UNCONDITIONAL GUARANTEE!